These eight tiny islands off Guadeloupe are visited primarily by small cruise ships. 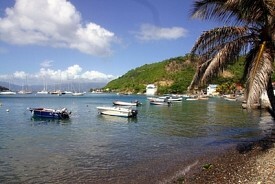 The ambiance here will please travelers seeking the old Caribbean, and the islands are delightful to explore. Tourists will find themselves wandering narrow roads and finding brightly painted boats and picturesque cottages. The clear waters are fantastic for swimming and snorkeling.